24K Funk - A Tribute to Bruno Mars available for Corporate Events, clubs, fundraisers and parties. 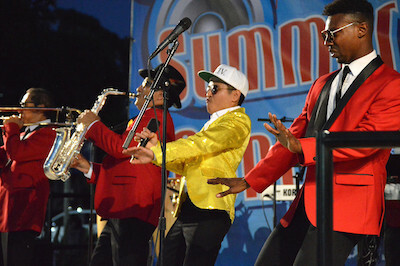 24K Funk is a tribute band dedicated to the precise replication of the signature style of Bruno Mars. You can expect to hear all the hits from past and present with expertly executed musical arrangements from professional, world-class musicians. No other rendition of Bruno’s music comes close to the level of concert reproduction that is 24K Funk. We guarantee you will be singing and dancing along with the entire band. Our show brings you the same mix of pop, funk, and R&B music that has made Bruno an award winning artist and international icon. If you are looking for a fun, energetic, musically diverse form of entertainment for your event, book us today!